No one has forgotten it. It was a quiet day, Sept.22, 1938, and work on the dam was going at a rapid pace. The dam had been completed just two weeks before, but there was murmuring among some of the men that something was wrong with the dam. The daily inspection of the embankment hinted at a problem. Survey crews were deployed to assess earth movement and to inspect the core pool. (The core pool was the pool on top of the dam, into which dredge material was pumped. As the water slowly drained out of the core pool, sediment settled below, thereby forming the dam.) Although the pool hadn't moved, the upstream pipeline shell ran lower than it should have. The day before the slide, the railroad tracks showed no signs of movement, so the work continued in the area. By evening, the situation had changed. At least two men suspected a problem was in the offing the night before the slide. Lewis F. Kao recalls putting in his 4 p.m. to midnight shift on the south (upstream) side of the dam. "That night the dam had started to shift. There was a 6-foot bow in the railroad track," he remembers. The next shift discontinued dredging in that area. James W. "Monty" Montfort also recalls the night before the slide. "I was foreman of a crew laying quarry stone on the four to twelve shift," wrote Montfort. "We were completing a tier of stone at the extreme east abutment and were to move the dragline... the dike section at the west end of the dam. "Water was coming up through the gravel and we could hear gurgling sounds beneath us. At 7 p.m., we began working off the mats; and as the weight of the machine was transferred onto the gravel, it began to sink and water rushed up around the tracks. "We moved in a bulldozer and a loadmaster and began building up with small mats. At about 11 p.m., we had managed to reach solid ground. The graveyard shift relieved us and moved out with the dragline. Our crew was muddy, wet, exhausted and glad to go home. The next afternoon, the slide occurred and the east upstream section of the dam was gone. On that tragic day at 1:15 p.m., even as District Engineer Maj. Clark Kittrell inspected the problem area from his passenger seat in a sedan, something strange and terrifying occurred. Suddenly, the earth started shaking, dredge pipes and railroad tracks started shifting and sinking and a massive section of the dam swung out into the upstream as if a great earthen gate hinged on the east abutment. Machinery and men alike were swallowed up in the moving, muddy hell and 5 million cubic yards of earth slid out into the Missouri River, forming its own island. Eight men lost their lives, and six are still buried somewhere in the dam. Some who lost friends in the slide consider the dam a large gravestone for those men whose bodies were never recovered. Word spread through the area quickly that the "dam was going to give," and people packed belongings quickly and headed for higher ground. The Slide of 1938 is the single most memorable event to occur during construction of the dam, according to dam workers employed on that fateful day in 1938. What caused the dam to slide? To this day, many say the core pool was too deep. Others say the dam was being filled too fast and there was not enough time for the water to drain out. Some blamed the bentonite seams beneath the dam. Soon after the rescue efforts were halted, engineers conducted a battery of complex tests to determine the cause of the slide. Samples were taken from as deep as 300 feet. A board of blue chip consultants was formed to study the problem, and it was their decision that work should continue on the dam. The board, which consisted of Joel D. Dustin (chairman), Arthur Casagrande, Irving W. Crosby, William Gerig, Glennon Gilboy, W. H. McAlpine, C. W. Sturtevant, Thaddeus Merriman and Warren Mead, met for a total of 20 days over a five-month period, studying 26 sets of technical data. On March 3,1939, the board returned its report, which said the slide's occurrence was "due to the fact that the shearing resistance of the weathered shale and bentonite seams in the foundation was insufficient to withstand the shearing forces to which the foundation was subjected. The board's seven-man majority recommended completing the dam, and work began once more. The base of the dam was widened, thereby flattening the slope, and the embankment was raised with rolled earth. A berm was added and sheet pile joined the old and new cores. A reinforced concrete wall was placed in front of the intake structures, and a protective two-mile dike was built. Piezometers and relief wells were installed in the dam. 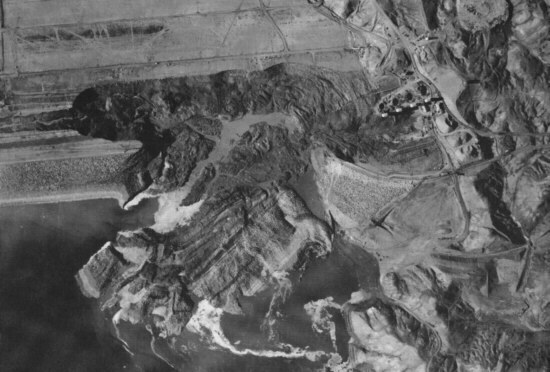 The slide delayed completion of the dam for a little more than a year, but on Oct.11, 1940, the last load of material was dumped on the dam, topping it out at 250.5 feet.